Jux2 Dumpster Rental offers self-service junk removal services. We will literally do the dirty work for you and remove all the unwanted junk in your homes and offices in Philadelphia. Our roll off rentals are easier to load than any other roll-off dumpsters and more affordable. Well, these are just a few of the concerns potential customers are often faced with. we specialize in one thing: delivering your dumpster safely, quickly, and with affordable, competitive pricing. We will rent you our dumpster at the most affordable rate so that you can be freed from the burden of how to dispose of your mountain of trash. What Size of Dumpster Should I Get? At Jux2 Dumpster Rental, we provide our customers the best customized solution on garbage disposal. This is indeed an important question since getting either an oversized or undersized dumpster could lead to unnecessary expenses. We have dumpsters with sizes ranging from 10 cubic yards up to 40 cubic yards. You can estimate the right size of dumpster that you need by the type and scope of the project you are doing and the kind of trash you are discarding. Slabs of concrete and broken down appliances that have no harmful components in them will occupy more space than smaller pieces of junk like planks of wood, roof shingles, and sidings. Read on to find out more accurately how to choose the right dumpster to rent. Our 10 to 15 cubic yard dumpsters are the smallest units we have. Perhaps you are tearing down an old fence, undergoing a landscaping escapade and need to get rid of tree stumps and weeds, these dumpsters are a perfect fit and an appropriate choice. The 20-yard dumpster is usually the prime choice for trash roll off rental since it holds up to 4 tons of debris (about ten pickup truck loads of “stuff”). Ideally, it is small enough to fit in your driveway conveniently. Our biggest dumpster, the 30 to 40 cubic yard container, can take in debris resulting from a new residential construction project or cleaning out of an entire office building. Interesting enough, our 30 and 40-yard dumpsters are noticeably larger than those of our competitors. Call us today at 215-437-0442 so we can help you find the right dumpster size. There are other considerations that could help determine the price for a particular roll off rental service in Philadelphia. The pricing is affected by several factors with size of the dumpster being one of them. Heavy scrap materials such as huge chunks of concrete will be more difficult to transport and the truck carrying it will consume more fuel. Heavier debris such as large pieces of concrete will take a longer time to load and unload. The heavier the load in the truck carrying the dumpster, the more fuel it will consume in transporting and disposing of the rubble. If you have secured the services of a contractor in your home remodeling work, you can find out from him the estimated amount of rubble that your project will produce and the right size of dumpster needed to haul it away. 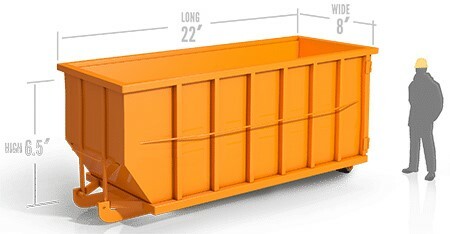 You can then use the information to order one of our dumpsters. It would be prudent to give our representative here at Jux2 Dumpster Rental a call at 215-437-0442 today to learn more about dumpster costs. We will let you know everything about prices and the types of dumpsters for rent based on your project. We would be glad to share with you our company price list for various dumpster services. After you’ve picked the most suitable your project from Jux2 Dumpster Rental, we encourage you to call your local county office to ask if you still need to secure a permit for securing a dumpster service. We advise all of our customers to contact their local county office in regards to whether or not you need to obtain a permit for your dumpster. There are important guidelines always to remember when renting a dumpster. Typically, you won’t need a permit if the dumpster is on a private property. This is used because of how the dumpster will involve a heavy amount of weight and will involve all sorts of wastes that may be difficult to clean up in some cases. Some local authorities require you to apply for a permit before you rent a dumpster unit. An important thing fact to remember is that in most areas a permit is needed if a dumpster is placed on the street. Purchasing a permit can resolve this, in some instances a permit can be acquired through the roll off rental company. When you need to rent a roll of dumpster in Philadelphia, give Jux2 Dumpster Rental a call at 215-437-0442. We can provide you with the roll off rentals that will handle any big or small project.